HindiCine.com: Box Office: Singham roars at the Box Office. ZNMD still rocking. Box Office: Singham roars at the Box Office. ZNMD still rocking. 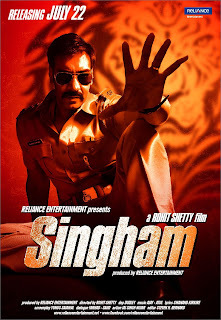 Singham which released this weekend had a fabulous opening collecting over 30 crore nett over its first weekend at the Indian Box Office. While the Friday collections were really good the business continued to grow over the weekend, Sunday being really huge. Singham is doing fantastic business at the single screens more so in smaller cities and towns. The multiplexes of the big cities have not responded as well but the collections there have also improved over the weekend. However the business from single screens has been so strong that it now has the second biggest opening weekend of the year after Salman Khan starrer Ready. Meanwhile Zindagi Na Milegi Dobara sustains brilliantly in the second weekend collecting over 11.5 crore nett which is amazing for a film in its second weekend while another big film has opened so huge. Zindagi Na Milegi Dobara had a massive first weekend of nearly 27 crore nett and continued to do really well even in the weekdays collecting over 17 crore nett on weekdays which is just amazing. Its total till the end of second weekend is nearly 56 crore nett and going by the way its been trending, its expected to continue to do as well in forthcoming days. This despite the fact that ZNMD hardly found any takers in single screens. However the second weekend collections from the major multiplexes in big cities have been even better than Singham in its first weekend.